As a board-certified family practitioner, Lada Galilova, DO, specializes in caring for people of all ages. Instead of focusing on a single treatment, she focuses on everyday illnesses like colds, flu and other respiratory diseases. If necessary, she refers her patients to another specialist at the Century Medical and Dental Center. Since 1987, Dr. Galilova has worked at several renowned national and international hospitals, including as a Medical Assistant at the Staten Island Orthopedics and Sports Medicine. She’s also been a volunteer at Victory Memorial Hospital. Since 2013, she’s been affiliated with the Century Medical and Dental Center in Brooklyn. She has a lot of experience helping heart patients, so she performs electrocardiography whenever needed. The test records the electrical activity of the heart, which allows her to diagnose specific heart ailments. As a result, many heart patients come to her for this procedure. Dr. Galilova completed her medical degree in Internal Medicine from the Azerbaijan State Medical University of Narimanoy. Then she earned her doctorate in Osteopathic Medicine from the New York College of Osteopathic Medicine. After her internship and residency at the Peninsula Hospital Center in New York, she’s been practicing ever since. She’s currently associated with the American Osteopathic Association and the New York State Osteopathic Medical Society. Fluent in English, German and Spanish, she treats whole families in Brooklyn. 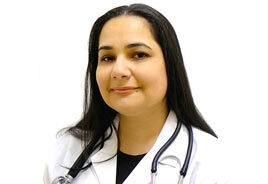 She’s a popular family practitioner since she spends quality time with each of her patients. Discover why she’s so trusted by making an appointment with Dr. Galilova.